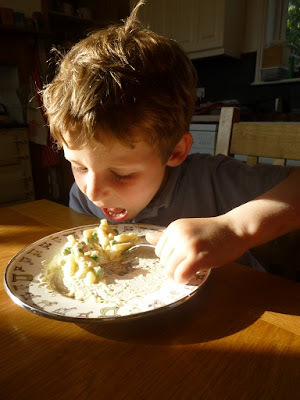 Here’s a quick round up of the last three days of the storecupboard challenge. 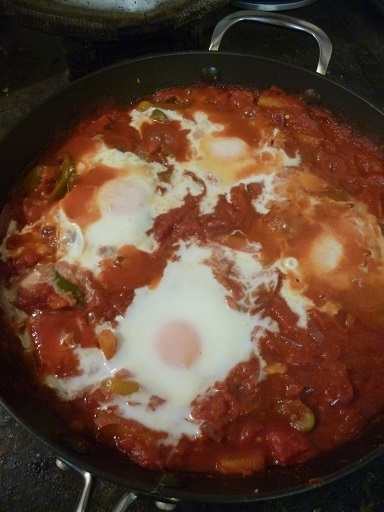 Eggs shakshuka: believe it or not the culinary highlight of the last 3 days. This was an easy one – staple breakfast of porridge with a chopped banana, grabbed a super quick lunch and we were all invited round to a barbecue in the evening. 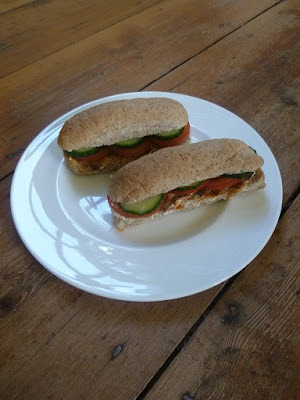 The quick lunch consisted of a couple of brown finger rolls left over from the children’s hot dogs, topped with half a tin of sardines in tomato sauce, the remains of some yogurt cream cheese (details here) and a few slices of cucumber and tomato. Breakfast was again porridge and chopped banana, followed by a lunch using the other half of the tin of sardines in tomato sauce. I mashed the sardines up with the last of the yogurt cream cheese, and used it to top a toasted sandwich thin. 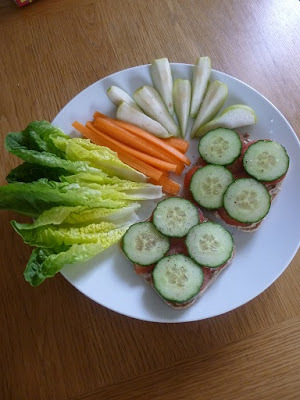 I had a bit more time today, so chopped up an array of lettuce, carrot, pear, cucumber and tomato. Pasta, cheese sauce, bacon and peas. Tastes great, looks dodgy. My daughter headed out tonight for the social extravaganza that was the Brownies’ Sheep Disco at the local church, so my son got the sole benefit of cheesy bacon and pea pasta. 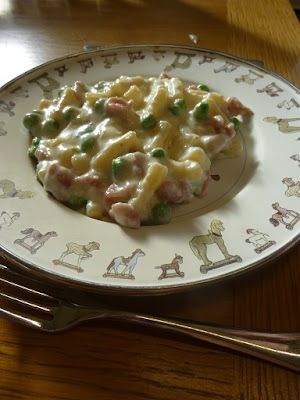 The meal was designed to use up the extra cheese sauce from making fish pie at the weekend, by adding plenty of pasta, frozen peas and some bacon from the Morrisons pack of cooking bacon. Despite looking distinctly unconvinced when it was first put in front of him, the pasta did disappear pretty fast afterwards, followed by mango and a bit of flapjack. In the evening I cooked egg shashuka, which I tried for the first time relatively recently. I believe the combination of eggs, tomatoes and peppers is meant to be a breakfast dish in some countries, but we prefer it in the evening accompanied by cous cous, crunchy bread or tonight’s yellow-stickered jacket potatoes. It would be a good recipe to try this week, if you are a fan of the mixed peppers included as part of Aldi’s Super Six vegetables. 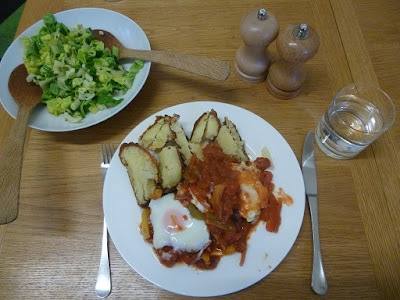 Eggs shakshuka with jacket potato and salad. You’ll just have to imagine the chopped parsley on top. Serves 2 if you want two eggs each, with extra sauce left over. I cooked the peppers and onion in a frying pan with the oil for about 10 minutes, until softened. Then I added the garlic, chilli, oregano, cumin and paprika and cooked for another minute. Stir in the tins of tomatoes, and simmer for 15 minutes or so until the mix thickens. If it gets too thick, add some water. Then use a spoon to make 4 hollows in the tomatoey sauce, crack an egg into each hollow, pop on the lid and allow the eggs to bake for 8 minutes or so (less if you like the yolks runny). I served up two eggs on each plate, and a decent amount of sauce, but then decanted the remaining 300g or so into a plastic box for a future meal. As it was a Saturday, my husband and children like to start withcroissants, and finished a pack of mini croissants stashed away in the freezer. I attempted to remain virtuous, while eating a couple of the Sainsbury’s Basics version of Weetabix with milk and a chopped banana. If you haven’t tried them, give them a whirl, as I think the Basic Breakfast Biscuits are virtually indistinguishable from Weetabix apart from having square corners and costing 95p for 24 rather than £2.40. The rest of my family all headed into Ipswich at lunchtime, where my son had a great time at a Soccer Stars party, while my husband took my daughter for a father/daughter meal at Pizza Express round the corner. worth of Tesco Clubcard points ages ago on a boost offer. Meanwhile I got the chance for a peaceful potter round the Hidden Gardens of Hadleigh, returning for a very late lunch of egg fried rice. global poverty. I was even asked to include the recipe (such as it is) in this article for the Mirror Online. soy sauce that can’t be crowbarred onto a £5 shopping list. I started by boiling up 75g of frozen mixed veg left over from trying out Live Below the Line recipes. good slug of soy sauce, some chopped garlic and grated root ginger. I chucked in the remaining 100g cooked white rice left from Day 1, and the last 100g cooked brown rice from making Mumma Jack’s Best Ever Chilli on Day 2, and added the drained mixed veg to heat them through. mixed with the rest of the fried rice. We do pizza and a movie night once a week, with the children’s choice of DVD from the local library. It’s normally a Friday night special, but we moved it to Saturday due to my daughter’s Brownie Sheep Disco. I’ve tried out assorted frozen and fresh pizzas, but while my husband is happy with Sainsbury’s Thin & Crispy pepperoni, the children prefer a more labour intensive version using baguettes. I cook part bake baguettes, top with a half and half mix of tomato puree and red pesto, and the chuck on whichever toppings are in favour at the time. Tonight it was some Morrisons Savers Mozzarella, black olives from Aldi, a few slices of German salami and some grated cheddar. I tend to put slightly different combinations on different baguettes. I served the pizza up with a crunchy salad, some celery sticks and the Matilda DVD. Miss Trunchball remains terrifying. Alright I have to ask ….. what is a 'Sheep Disco' , do the brownies dress up as sheep, invite sheep or dance to sheepy music? This year, Hadleigh is all about the Year of the Sheep, including so far "I'm a Sheep, Get Me Out of Here" at the Hadleigh Show, the Bo Peep picnic and decorating a sheep at the library. Sorry to say the Brownies didn't have to dress up as sheep, but they did do sheep crafts at the disco.